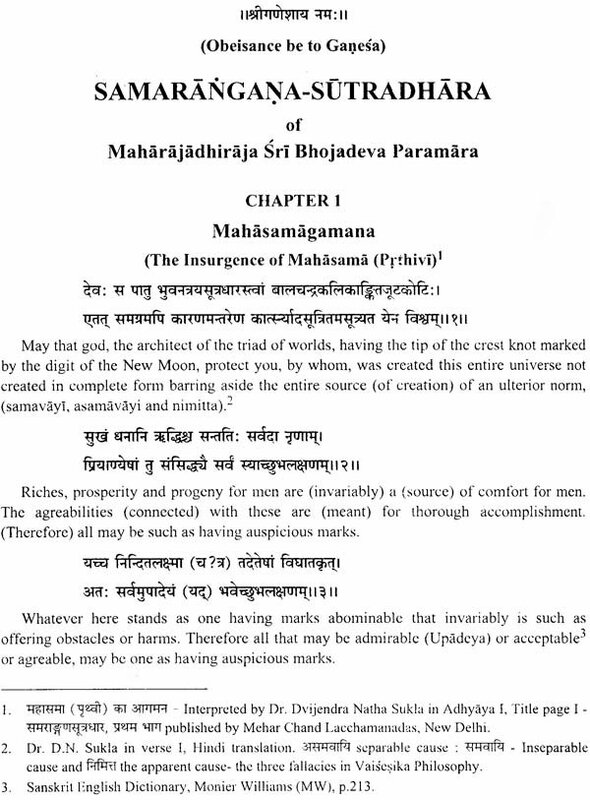 Sri Bhojadeva was first and foremost a man of great learning, a versatile scholar, a polymath indeed, for he has been credited with works in almost every branch of knowledge. 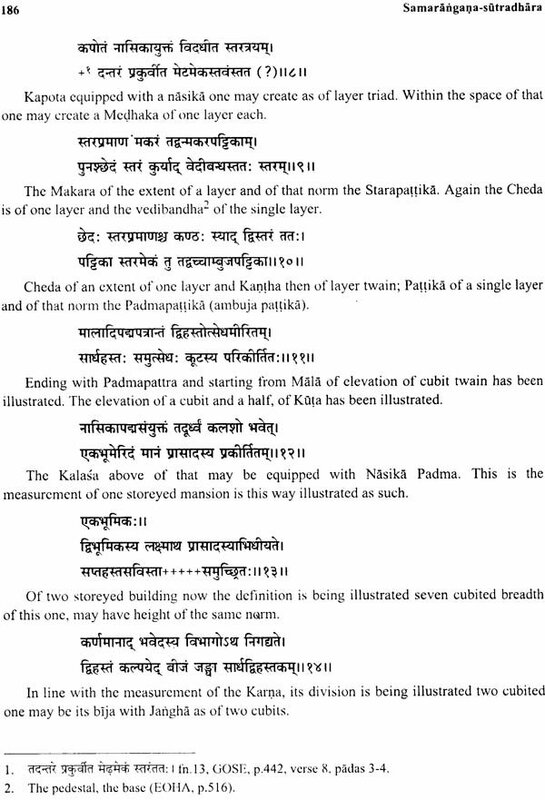 According to Ajada who wrote a commentary named Padakaprakasa on Sarasvati Kanthabharana, Bhoja wrote 84 works giving them names with his own titles and binds. 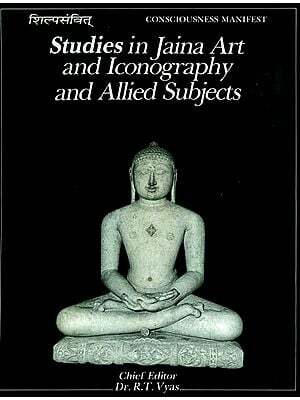 Of the various works ascribed to him, Samarangana Sutradhara is a voluminous treatise, an architectural masterpiece, dealing with technical subjects such as town planning, house architecture, temple architecture and sculptural subjects like Pratima Laksana, Iconography, Iconometry, Iconoplastic art together with Mudras, the different hand poses and the poses of the body as well as the postures of legs. It deals with the canons of painting and devotes a big chapter to the art of mechanical contrivances, the Yantras. 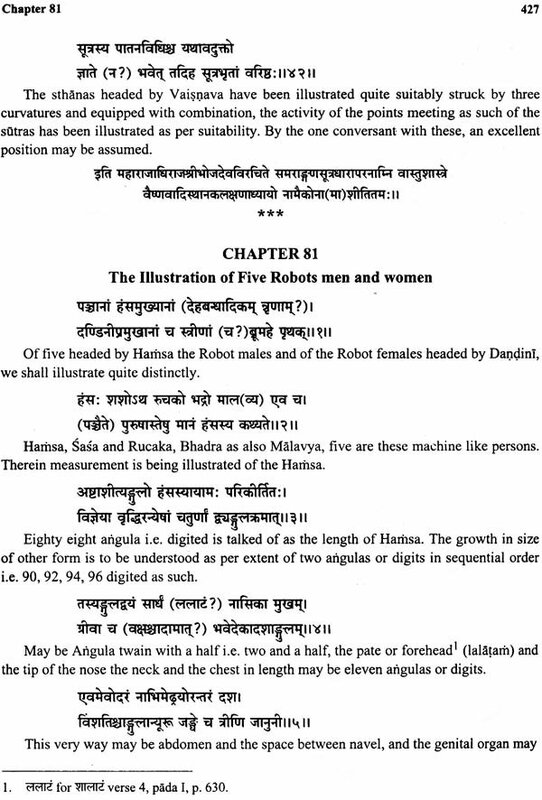 Samarangana Sutradhara is in eighty three chapters with chapter thirty one specializing in the mechanical contrivances and Yantras, having verses 95-100 dealing with the construction of bird shaped aerial cars and verses 101-107 dealing with the Robots meant to act as guards. 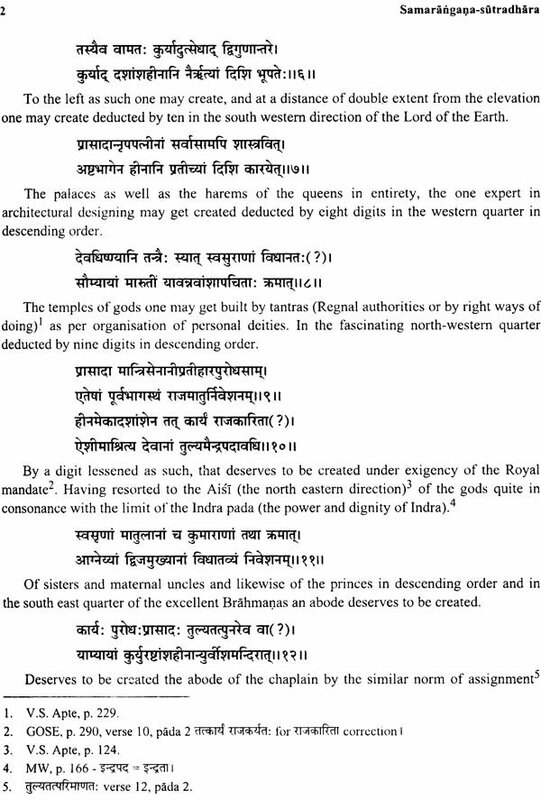 This is the first time that an English translation of this great architectural work has been attempted with various annotations and the complete original Sanskrit text. 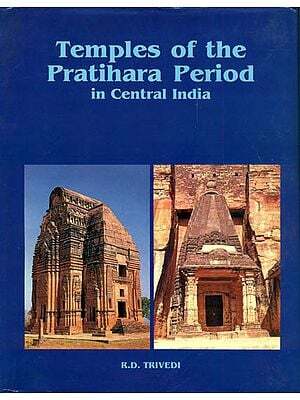 This is definitely a landmark in the field of ancient Indian architecture. Dr. Sudarshan Kumar Sharma is B. A. (Hons. ), M. A. Ph. D he completed his graduation from D. A. V. College Jalandhar in 1955 with First class first in Sanskrit (Hons.) and post-graduation in 1958 from Deptt. 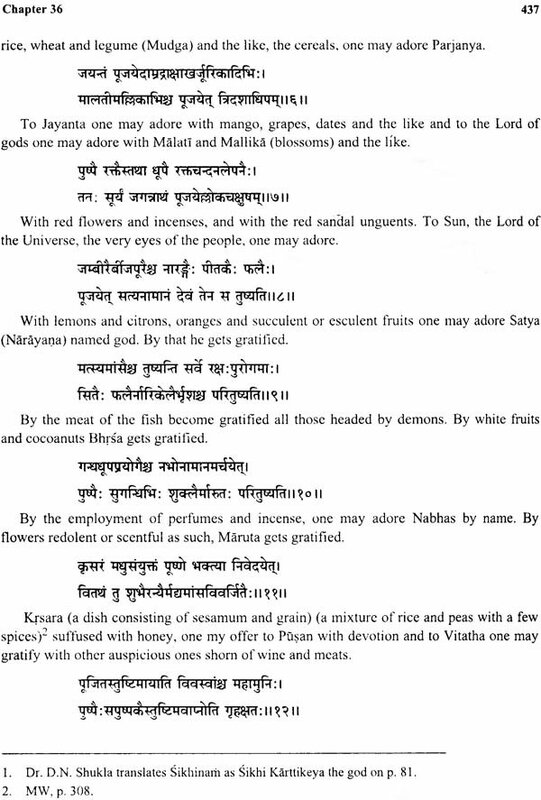 Of Sanskrit, Punjab University, Jalandhar. 1. 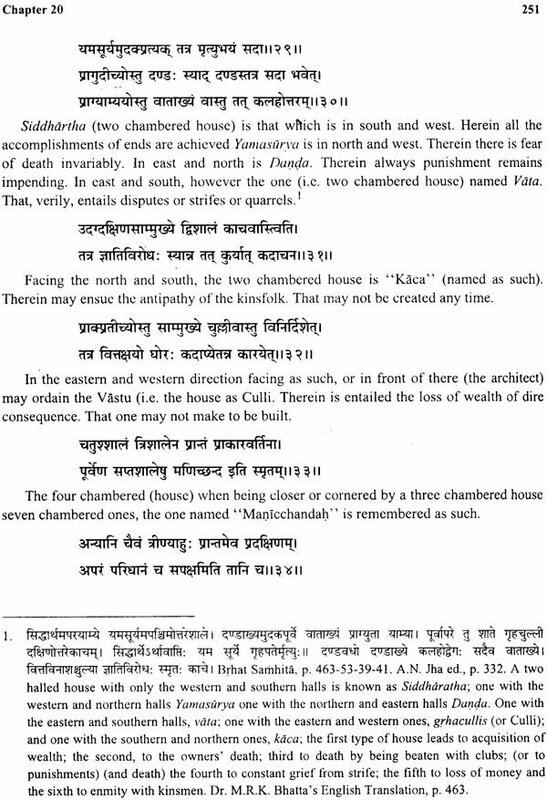 Tilakamanjari of Dhanapala-A Critical and Cultural Study. 2. 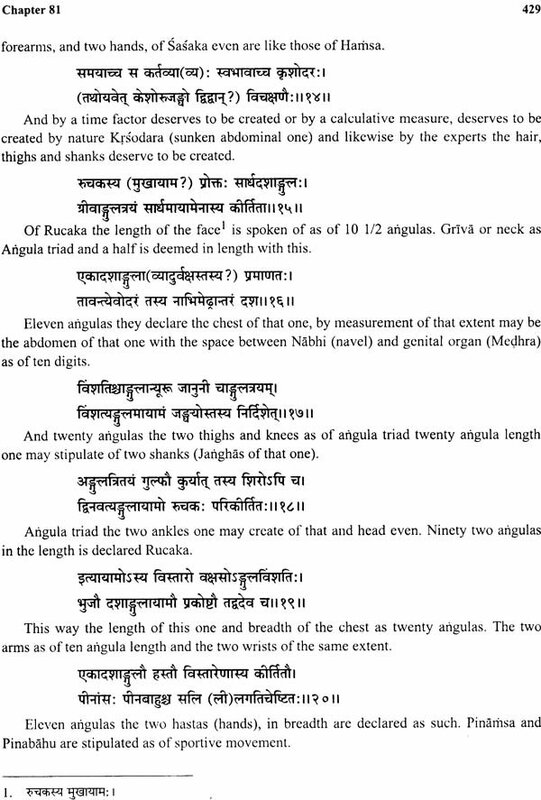 Mrcchakatika of Sudraka - A Critical and Cultural Study. 4. 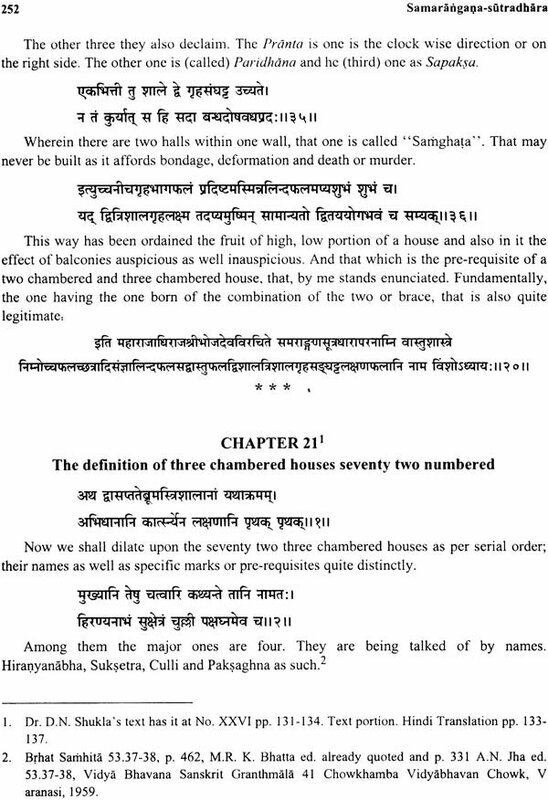 Yajnaphalam of Bhasa (Sanskrit text with English and Hindi translation). 5. 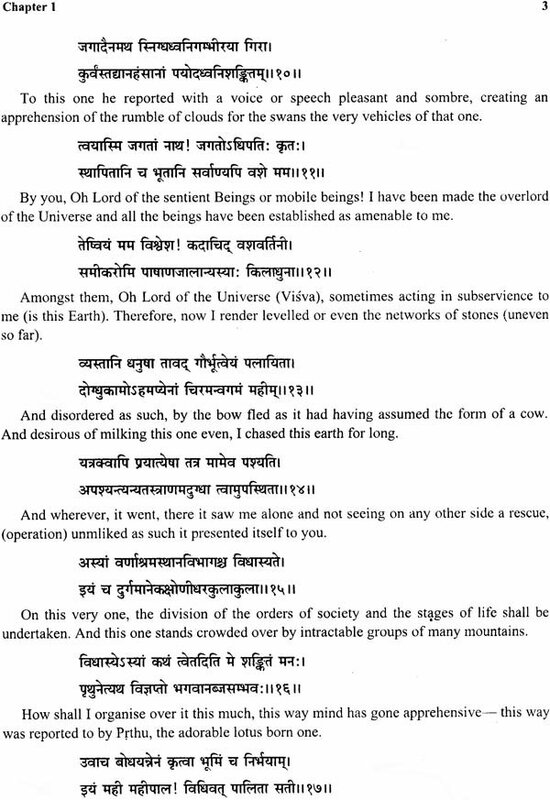 Udayasundari Katha of Soddhala (Sanskrit text with English translation). 6. 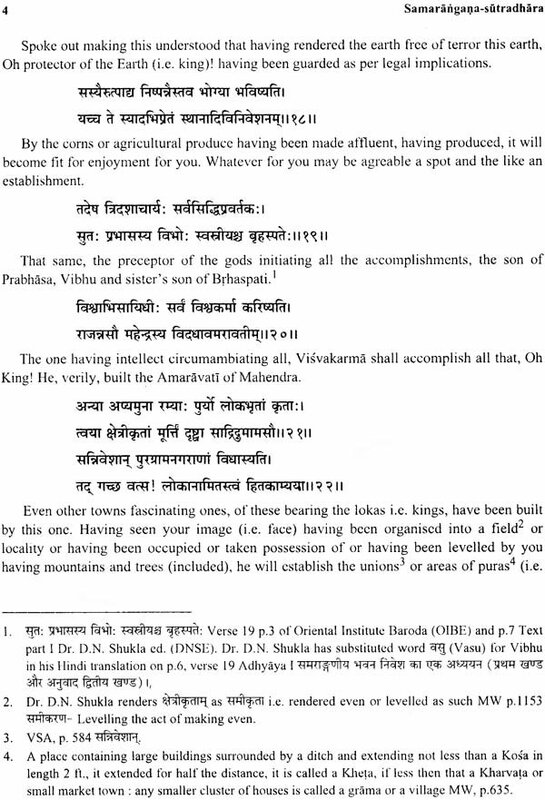 Mandaramanjari of Visvesvara Pandeya (Sanskrit text with English translation). 7. 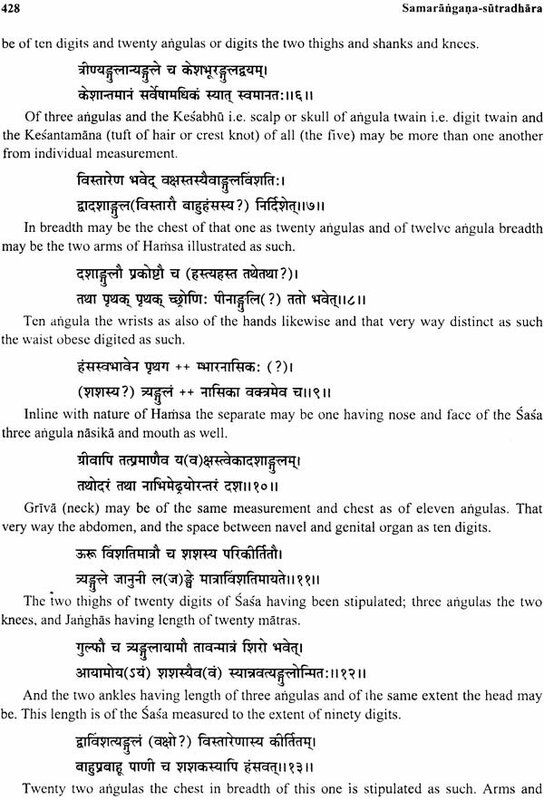 Brhatkatha-sloka-samgraha of Buddhasvamin (Sanskrit text with English translation). He had been an active participator at various Oriental conferences and Seminars held in the past at various places of India. His research papers and journals have been published in almost all magazines and elicitation volumes. Since his retirement, he has been an active writer and doing critical translations of various rare books. His forthcoming books are-Garuda Purana (Sanskrit Text with English Translation), Vayu Purana (Sanskrit Text with English Translation), Brhat-katha-manjari (Sanskrit Text with English Translation), Kalki Purana (Sanskrit Text with English Translation), Kalki Purana (Sanskrit Text with English Translation), Avantisundari-katha (Sanskrit Text with English Translation) etc. I. Anthology - Subhasita Prabandha. IV. 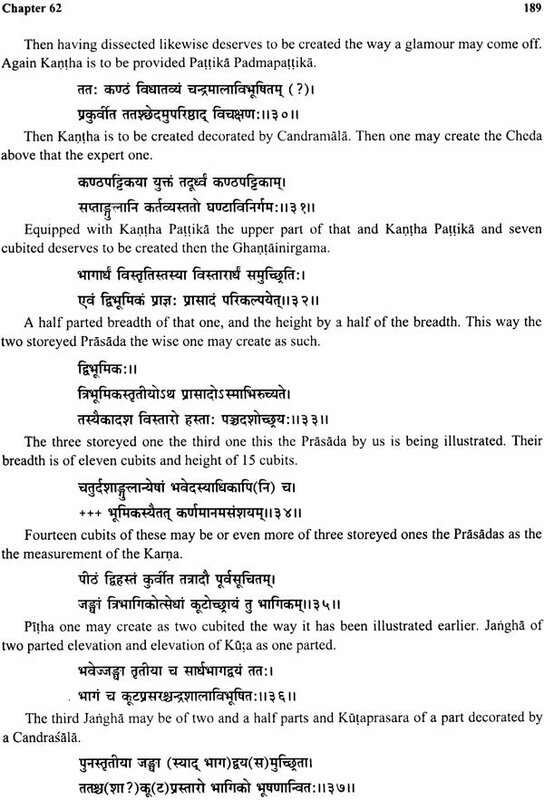 Dharmasastra, Rajadharma and Polity - Bhujabula (Nibandha) Bhupala Paddhati. Bhupala Samuccaya or Krtyasamuccaya. Canakyanitih or Dandanitih. Cauncarya; Vyavahara Samuccaya; Yuktikalpataru; Purtamartanda; Rajamartanda; Rajanitih. VII. 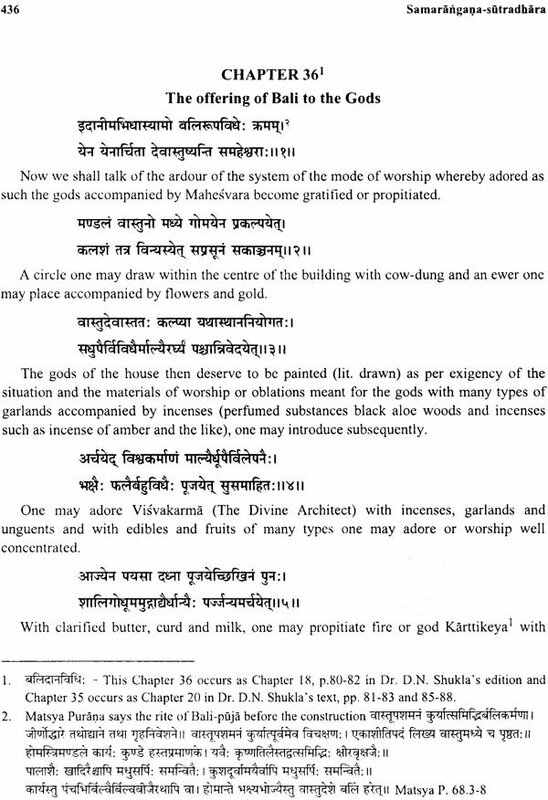 Medicine - Ayurveda Sarvasva; Rajamartanda or Yogasara Samgraha Rajamrgarika; Salihotra; Visranta Vidyavinoda. VIII. Music - Sangita Prakasa. X. Prakrta poems - Kurmastaka 2 vols. XII. 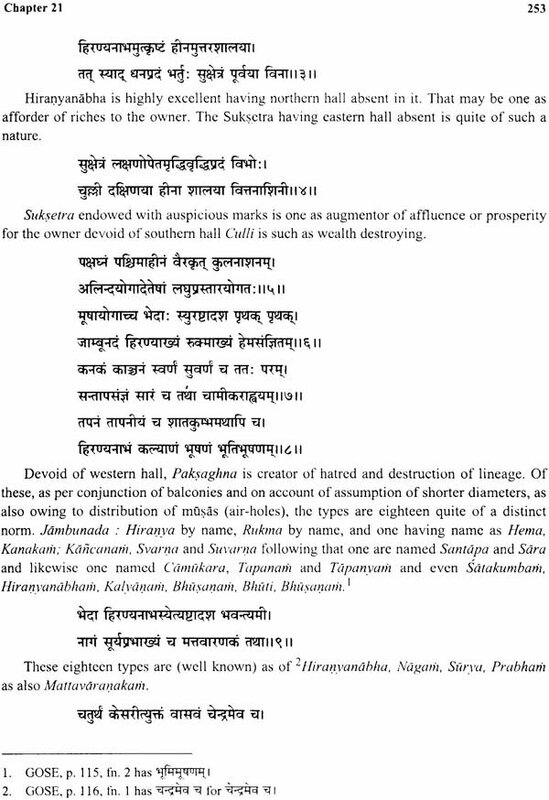 Sanskrit poetry and prose - Campuramayana; Mahakalivijaya; Srngara Manjari and Vidyavinoda - only 38 composition. Though K. M. Munshi and Dr. Ganguly doubt the handiwork of Bhoja on all. A general editor he may have been. 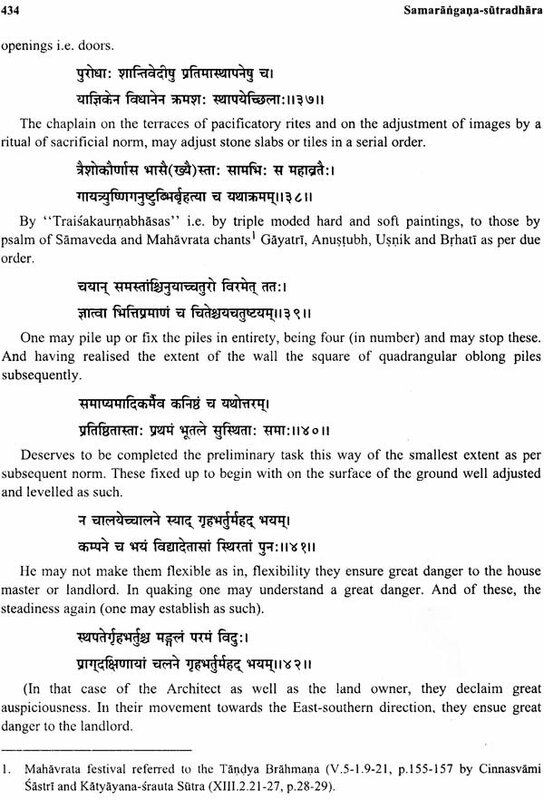 Samarangana Sutradhara is a voluminous treatise dealing with technical subjects such as town planning, house architecture, temple architecture and sculptural subjects like Pratima Laksana, Iconography, Iconometry, Iconoplastic art together with Mudras, the different hand poses and the poses of the body as well as the postures of legs. It deals with the canons of painting and devotes a big chapter to the art of mechanical contrivances. The Yantras. 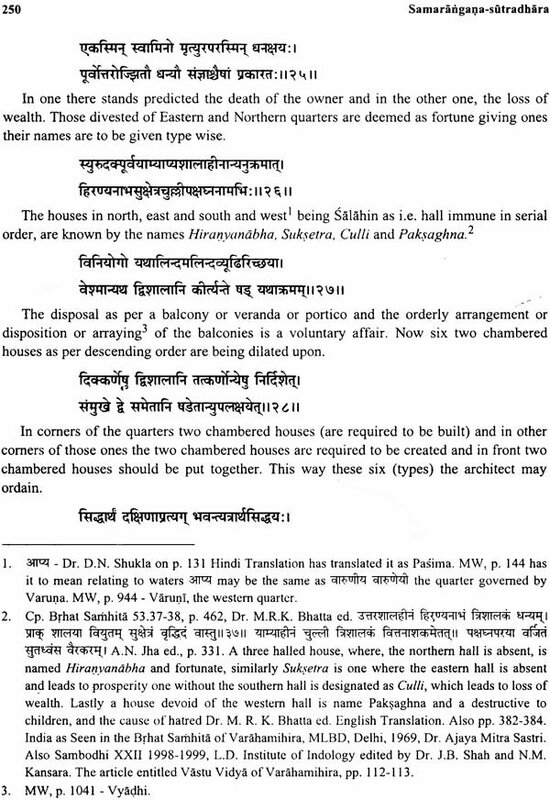 The Yukti Kalpataru (also architecture, arts and crafts) Srngara manjari katha (an akhyayika in prose). 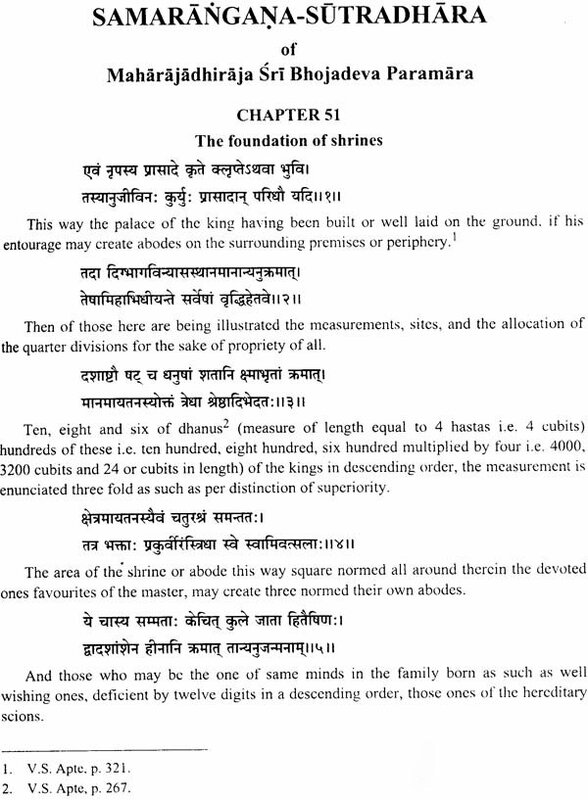 The Vyavahara-manjari referred to by Vimalabodha, a commentator or Bhoja Campu, Avani Kumara Sataka (having two Prakrta poems engraved on a stone slab in Bhojasala at Dhara) each having 109 stanzas in Aryamitra! 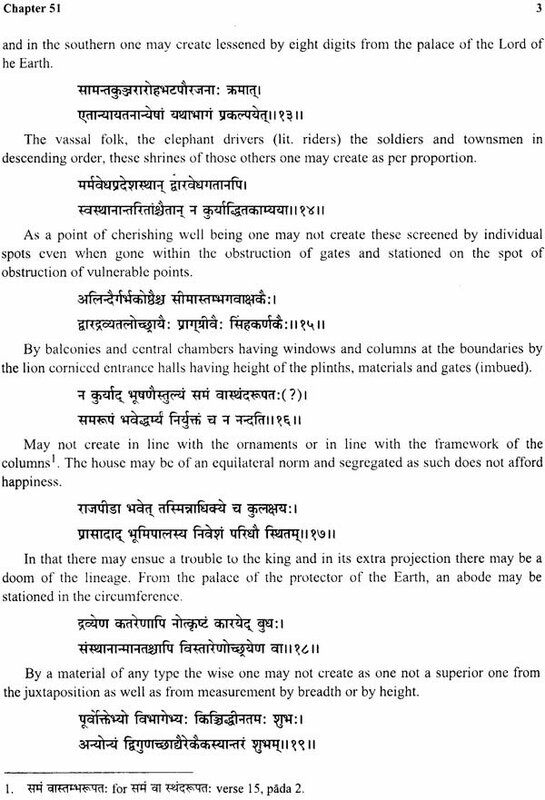 Vidvajnanavallabha Prasna Jnana (predictions on dreams), Nama Malika and Salihotra (lexicography and veterinary science). 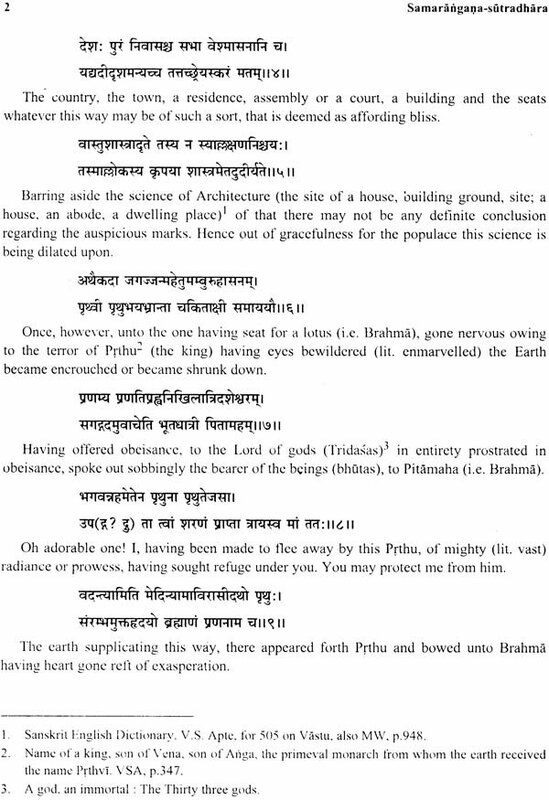 A work on music quoted by N. P. Cakravarty records two Prakrta poems engraved on a stone slab in the Bhojasala. i.e. mounted over or into that the man by the breeze released owing to flapping of wings twain by the energy of its mercury, taking to marvels -flies far away into the sky. 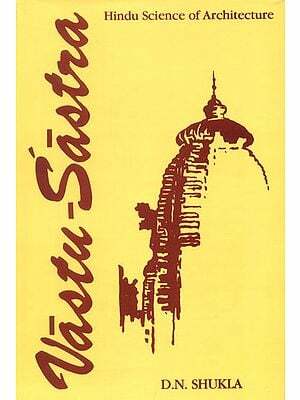 Samarangana Sutradhara, GOSE, pp. 183-184). A wooden bird in whose hollow body is placed a copper contrivance one inch long and one quarter inch high, of slender cylindrical shape in two well joined halves allowing a hole at the centre along which air passes when the bird moves creating a pleasing sound. 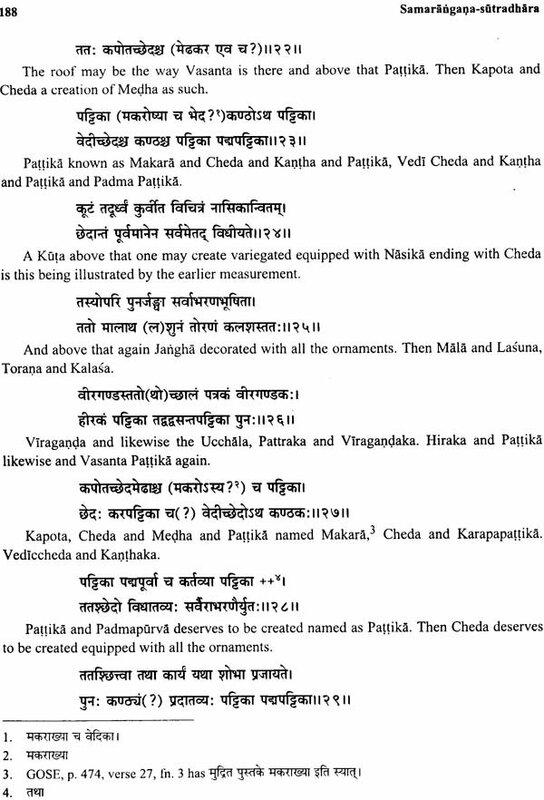 Also in the hollow of the bird above, mentioned is placed a small drum like piece in halves and with an air passage as in the previous Yantra; the interior device is to be loosely hung and as the bird oscillates a highly pleasing sound is created which reduces the anger of the ladies who are cross. Having created by a brace of well knit pieces having shape of a small drum (placed) inside, having a hole, a concavity softer one deserves to be made, in centre with a brace of ear penduncles or coils entwined as such in the mechanical contrivance already spoken of having a hollow, in a systematic manner, contrived as such. Then this bedroom accessory owing to mobility or fluctuation creates a sound that creates a thrill for a sport of love. According to Dr. Narayana Manilal Kansara - The word "Vastu" literally means a place of residence or a house site and a house proper. 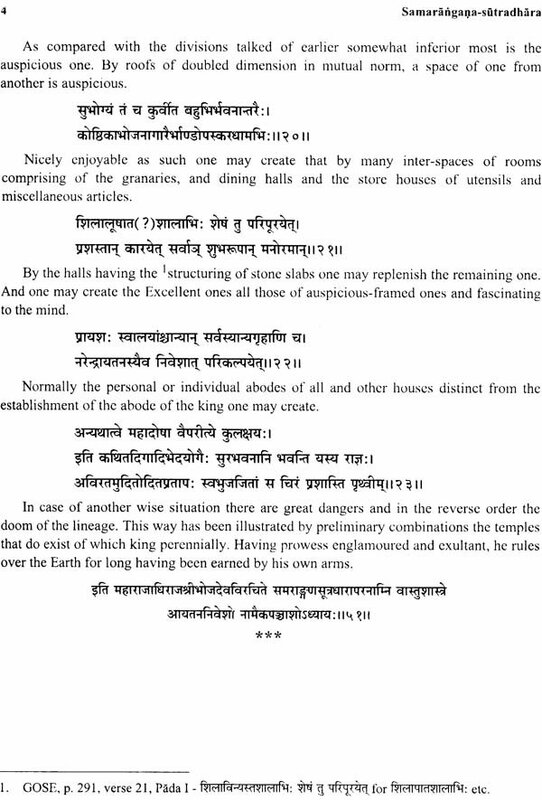 Varahamihira uses "Vastu" in the strictly limited sense of a residential building. (Vastu Vidyadhyaya) (No. 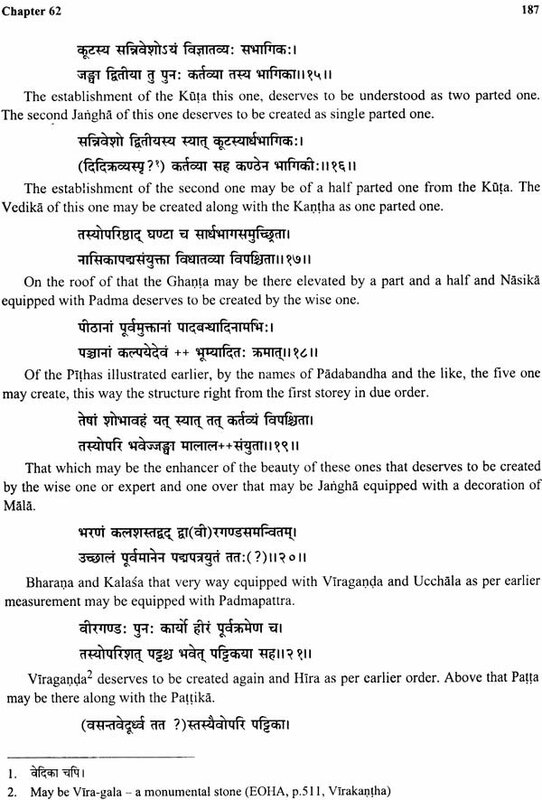 53) Verse 2 and 3 refers to the "Vastu" nara as (p. 317). 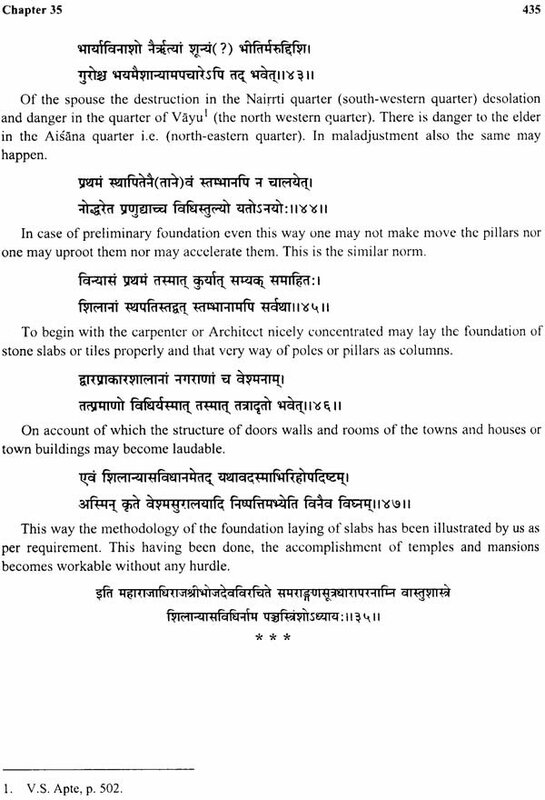 Or "Vastu Purusa' referred to by L. S. Rajgopalan in the article (p. 24) entitled Construction of the Kuttambalam Temple Theatres - of Kerala from (Trichur). (Samskrta Ranga Annual Vol. VIII, Silver Jubilee Volume (1980-1987). Edited by Dr. S. S. Janaki. The Sanskrit Ranga, High Road, Mylapore, Chennai.